2016 was a big year for Honda in part due to the launch of the all-new, 10th generation Civic. How new is all-new? Seeking to reset the bar in the segment, engineers started with a clean sheet. A new chassis architecture, new rear suspension, and a new 1.5L turbocharged engine are among the highlights. We spent a week with a new Civic Touring to understand just how far this new generation has come. First off, the looks. The new Civic is the most visually interesting model in recent years, but that doesn’t mean everyone finds it attractive. The chrome uni-brow and long, drawn out d-pillar can make it appear liked a hunched-over neanderthal from some angles. From others, it looks more coupe-like. Regardless of our mixed opinions on the outside, the interior design of the Honda is best-in-class. Comfortable, sophisticated, and made with some of the best material’s we’ve seen on a vehicle for less than $40,000, Our only complaint for this interior stem from Honda’s recent over-complication of volume control. We’ve pointed out our disappointment with Honda’s touch/slider control on the infotainment display, but the new Civic carries the same touch/slider combination over onto the steering wheel. Pushing the +/- will affect a change in volume, but the entire piece is also a haptic slider. Accidentally brush a finger across it and you’ll be muting your favorite song or blowing out your eardrums. It’s just not good. The Civic Touring’s party piece is the all-new 1.5L turbocharged engine. With 174hp and 162lb-ft torque, the numbers don’t tell the whole story. The only transmission paired with this new motor is a CVT that doesn’t even provide the driver an option to select any pseudo-gears. You’re stuck with whatever Honda’s transmission engineers thought would be best. And you know what? It works. The engine’s character somehow cuts through and provide the power without feeling laggy or forgotten by the transmission. Pairing the peppy powerplant with Honda’s stiffer and lighter architecture, this new Civic really shines. 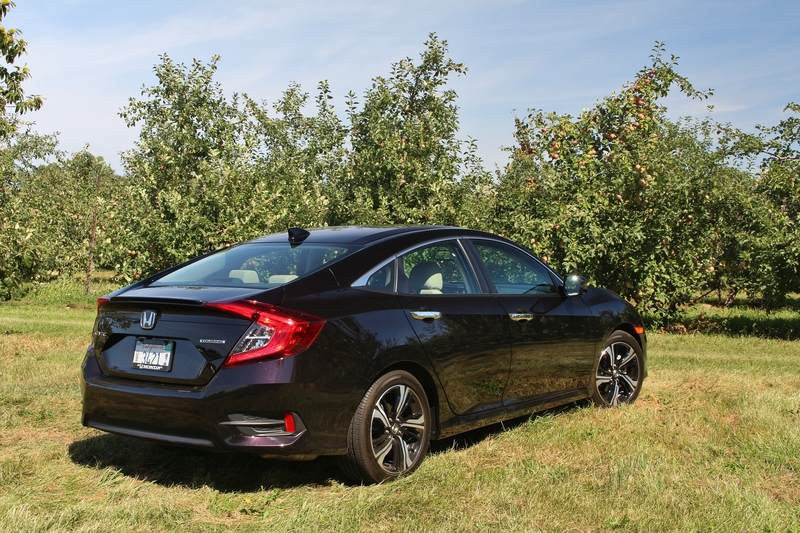 After two weeks of driving the competition, the disappointing Hyundai Elantra and the venerable Mazda 3, the Civic surprised us all by resetting the bar. The comfortable ride pairs with excellent steering and braking feel to strike the perfect balance of usability and playfulness. Even with several sessions of spirited driving, the new Civic’s fuel economy didn’t suffer. Over the course of the week, we averaged 35.1 mpg. Whether you’re feeling frugal or fun, the Civic is ready to play along. 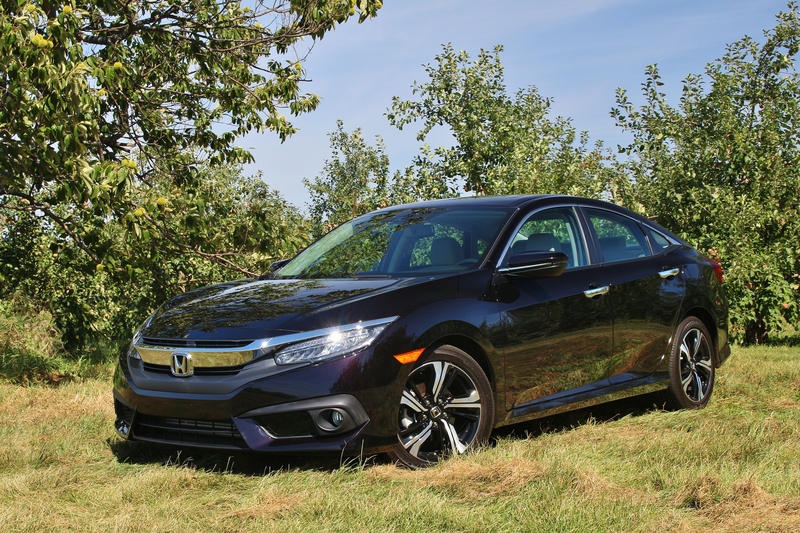 A week with the Civic brought continued comments on its comfortable ride and quiet cabin. Our tester’s LED headlights might also be the brightest we’ve seen since the Cadillac Escalade. This top-trim Touring included all the expected driver aids that have tricked down into the segment; blind spot monitoring, rear cross traffic alert, collision warning, and adaptive cruise control. Honda’s Lane Watch is unique and, after getting used to it, proves occasionally useful. But not all the Civic’s feedback was so positive. The safety systems are overeager to protect you from yourself. While we might have been better served to shut them off, we typically avoid that. Even worse, Honda has replaced the typical seat belt chime with the voice of a woman alerting you to exactly which seat belt should be fastened. Shame on our occupant for triggering this test, but we’ve never been scolded by a car before! Besides the highly attentive driving alerts, the Honda’s high rear deck restricts rear visibility. Rear view cameras have all but replaced the need to turn your head, but it still bothered us in the Civic, especially when the rest of the greenhouse had such excellent visibility. 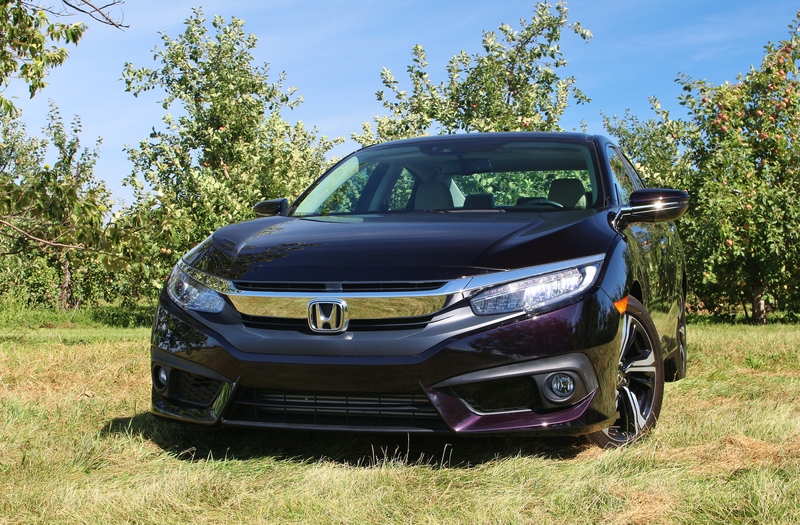 The new Honda Civic is a conundrum for the driving enthusiast. How is it possible to have such an engaging driving experience with a CVT? The all-new turbocharged engine and chassis are so good, you almost don’t miss having any say over the transmission. Without having to focus on gear selection, there’s more time to admire the Civic’s top-shelf interior. It’s, by far, the most comfortable and well-appointed cabin in its class. The Civic’s fun-to-drive nature combined with its practicality and comfort prove that Honda can still punch well above its weight class.